I am SO excited for this week!!! Its finally here after a few weeks of discussion and ideas being thrown around!! This is our first official challenge week and for this week's challenge for us girls is to create a Fall or Halloween themed project using the Paper Dolls Dress Up Cartridge. So all week each of us will be showcasing a project on our designated days. To start off our Challenge Week, Cristi is the first to showcase her project!! And let me tell you, her project is absolutely ADORABLE! So you need to hop on over to her blog at Scrappin 5 Little Cupcakes to check our her project! Tuesday & Friday: I will be showcasing my project here! On Sunday, All 3 of us will have a new project posted here on my blog but with an added element (color challenge, must use: ribbon, buttons, brads, must incorporate a particular image, etc.) and we will have a Special Guest Designer to give you a little more inspiration!! Sunday will be your chance to enter in on the challenge!! I will have a Mr.Linky up and you will have a week, till Saturday the 26th, to link your project! Then on Sunday (27th), we'll announce the winner! Oh and just because we're designated certain days, doesn't mean that those are the only days we will necessarily be posting. 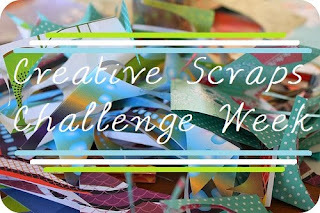 We will be posting our own work during the week...but are designated days will be dedicated to the Creative Scraps Challenge. SO excited to get this party started!!! I love the button!